If you were given the option, would you do this? Sell off the street in front of your house for development, leaving only walking access. 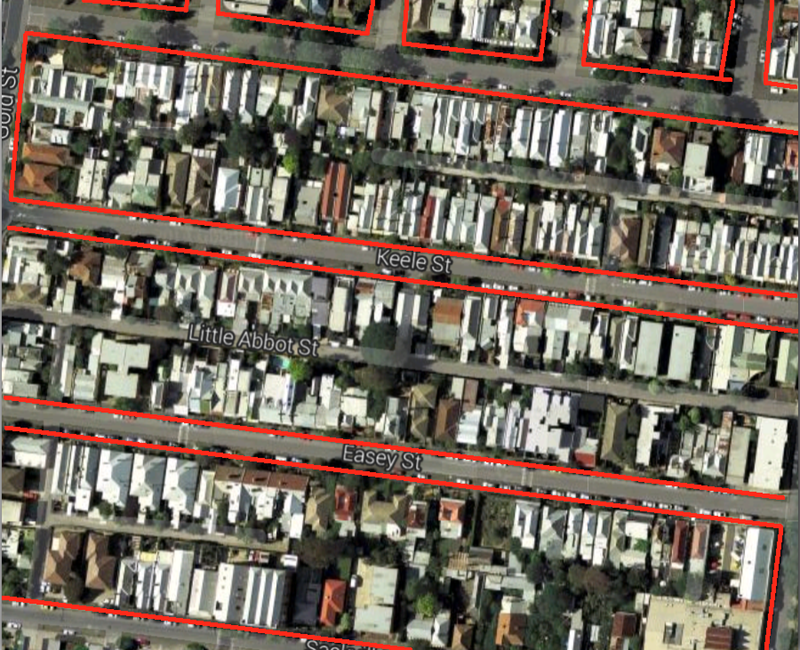 Streets – outlined in red – take up about 30 per cent of this area in the backstreets of Collingwood. Google maps draws streets as thin little lines, but that is misleading. They can be wide, sometimes more than half as wide as the blocks are deep. Is dedicating so much land to traffic really wise? Especially where you have dead-ends, those streets are minimally used. The last 20 metres of a cul-de-sac might see only 10 car trips a day. To me, that seems wasteful. Selling off your street would be unacceptable in a scenario where house prices were low. But Australia’s house prices are high. It makes sense to use land for its most valuable purpose. The land in front of my house and the neighbours (which is also, of course, in front of our neighbours opposite), might be worth $500,000. If the decision to sell it off meant a windfall of $125,000 for all four parties, all parties might be tempted. The way to make this work would be to build a parking structure within a reasonable distance. The land at the end of the street, nearest to the main road, would be a logical place for that. This hypothetical might seem odd. It’s not standard to think of suburban streets as optional. But we should ask why they are compulsory. Walkable laneways for access are part of some very desirable housing options, including big resorts and hotels, big apartment developments, and whole cities, including this car-free city in China, the “old towns” of many cities of Europe, and of course, this little place in Italy. Meanwhile, Los Angeles CBD is 24 per cent streets and 25 per cent parking, according to one analysis. This blogger has a fantastic post on the topic of area given over to streets. He emphasises that it is highly variable by neighbourhood. Street dominance is not a given, it’s a variable. That means it can be up for debate. I was inspired to think about whether we really need all our suburban streets after reading about road pricing in a recent speech by the head of the Productivity Commission. There are already tolls on some of our most popular roads. But the vast majority of roads (by length and by area under tarmac) are side streets. Attempting full cost recovery for these would be very expensive for the people who use them. If my street cost $10 million to build and requires a return of 7 per cent, the locals must generate $700,000 a year in revenue. If there are 50 car trips a day ( a car every 20 minutes in the 16 waking hours), those trips will be charged at $38 each. Ouch. You might not sell off the land in front of your house when the alternative is a lovely street you get to use free of charge. But if that street were tolled, the combined carrot and stick might change your mind fast. If you lived on a main road, obviously it would not be in the public interest for the land in front of your house to be sold. But equally, the number of people using that road would be much higher, so the toll would be a lot lower and the “stick” part of the equation less compelling. Obviously there would be massive coordination problems and equity challenges associated with such a plan. Selling off the road at both ends of the street would pretty much force the people in the middle to do the same. And if someone with major mobility problems lived on your street it might be unfair. This hypothetical question will remain hypothetical for a very long time. But the fundamental issue here is not unlike the question of burying rail lines, providing surface parking, or putting roads in tunnels. 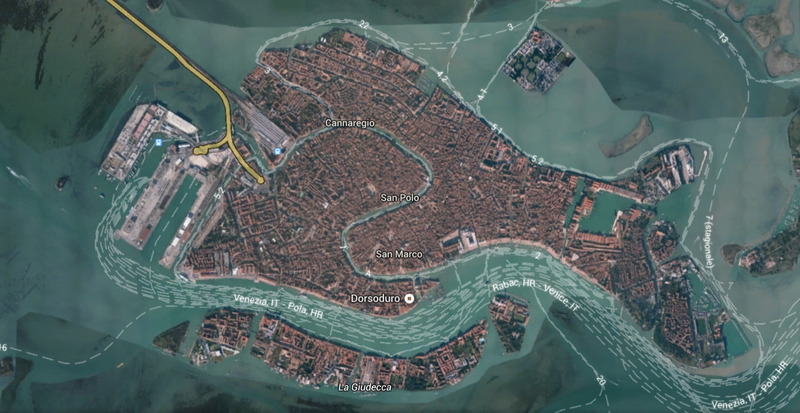 What is the most valuable use of our scarce city land, and how much are we relying on legacy structures to determine those uses? Previous Previous post: “Burn it down, start again.” Why a big fire might actually be good urban policy.